After working for more than 30 years as a bookkeeper at her father’s business, Dianne Feducia decided to pursue her dream of becoming a florist. In 1991, she enrolled in a floral design course at Bossier Parish Community College, earning her state license one year later. 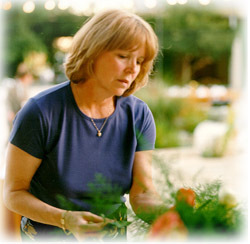 When her former instructor Bobby Davis left the college in 1994, he hand-picked Dianne to take over the floral design program, where she taught for seven years. More of her students passed the state floral exam and received their professional licenses than any other instructor in Louisiana. She attended the prestigious Benz School with Jim Johnson at Texas A&M University, and she has presented floral design seminars at the Barnwell Garden and Art Center in Shreveport and several garden clubs throughout the region. She is a past member of the Royal Horticultural Society of Great Britain and a current member of the Society of American Florists. Dianne lives in Shreveport with her husband Carl. They have two daughters, Stacy and Kelly, and two grandchildren, Carl and GraceAnne. To arrange a consultation, please email Dianne@dfflorist.com or call 318-797-1259.